You don’t need to know this but this is my second attempt to write this post. The first one ended tragically. Staying in the laid-back seaside town of Essouria at the end of a wonderful Moroccan cycling trip I decided to walk across the little stream at the end of resorts huge and very beautiful beach. I’d already done this a couple of days before only to discover halfway across that a stream that barely features when the tide is out is a different proposition when it’s not. Carefully protecting my camera as the water rose above my waist I completely forgot that my phone, containing the first version of this blog, was in my back pocket. The phone, of course, was a dead as a dodo and although for days afterwards I was convinced that it would somehow forgive me for my memory lapse and return to life, it never did. The death of my phone and turned out to be the only serious hitch in what was otherwise a brilliant trip. 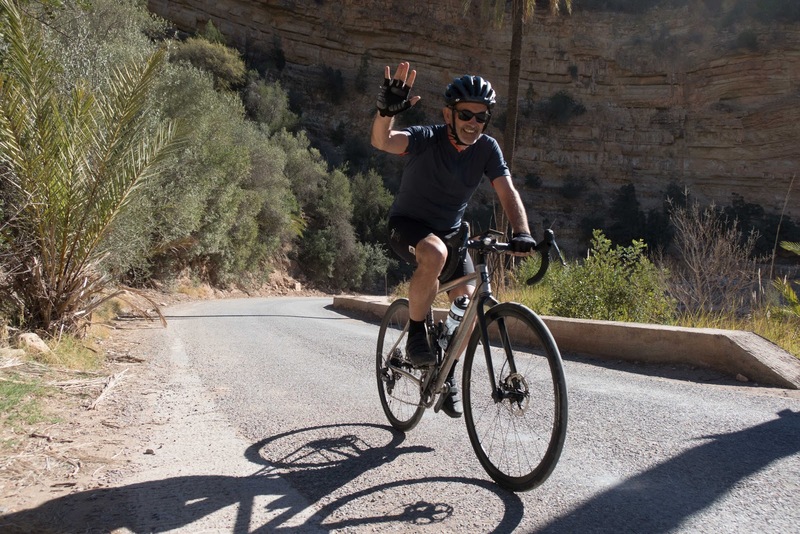 This is our fifth midwinter cycling getaway, second with Skedaddle, but the first which hasn’t involved travelling to the other side of the world. We were keen to visit Morocco not least because we wanted to find out whether this was a place where we could enjoy winter sun on a more regular basis. The eight-day cycling trip was the first road cycling trip we had done and based on a sample of one the trip was significantly different to the others which were all non-technical off-road. Although graded at a similar level (level 3 out of 5) it was by some way harder. Perhaps we shouldn’t have been surprised but a trip that crossed the Atlas Mountains twice involved a lot of big ascents. The second difference was the group, which was both a little younger than the other groups (we were the oldest couple) and a lot more athletic and included a significant sprinkling of what I can only describe as serious cyclists. Both differences made for a more challenging but very rewarding trip. We took our own bikes but unfortunately, Christine's got slightly damaged on the plane. No knowing what a derailleur hanger was we didn't pack a spare (will next time) and Christine had to hire a bike. The hired bike was very good although it didn't fit as well as the bike from home and reassuringly, given how much our bikes cost, was not nearly as fast on either the descent or the flat. The itinerary involved an initial north to south traverse of the Atlas Mountains, including a visit to the village that sits immediately beneath the highest mountain in the range, Mt Toubkal; three days in the Anti-Atlas Mountains and then, heading home now, a final south - north traverse of the Atlas. While a couple of short mini bus rides helped us cover the boring bits, bus transfers were kept to a minimum. The trip, in fact, was very well run by the tour leader, Saiid, cleverly combining a light touch with humour and good organisation. The freshly cooked lunches en route were particularly good and, unusually, you were well fed whether or not you were a meat eater. The quality of accommodation was determined by what was available in the mountains and was interesting rather than luxurious. As discussed already we found the cycling a little challenging. 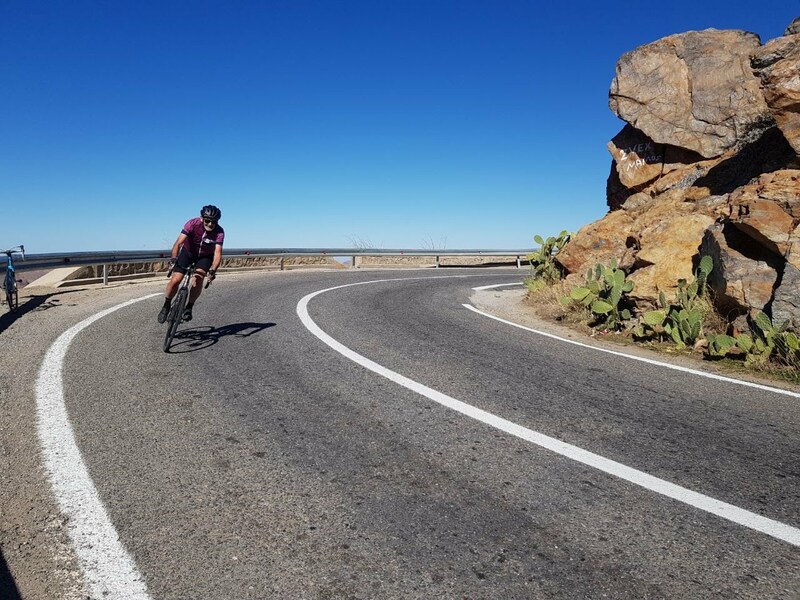 There were seven days cycling with an optional ride on the rest day. 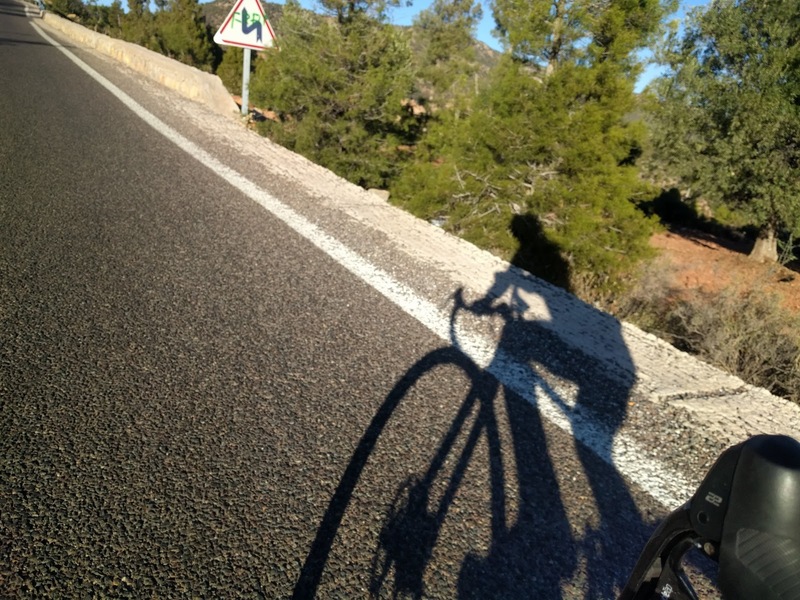 Three of the seven days involved sustained multi-hour climbs and optional ride on the rest day was also a tough one. 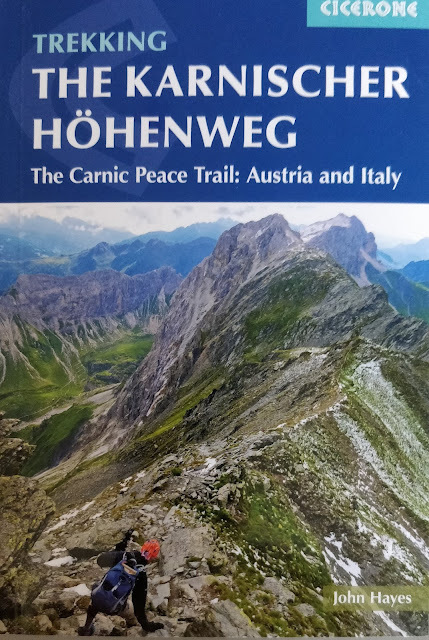 The reward for these long climbs was a series of huge descents and although I for one managed to scare myself completely several times they were great fun. 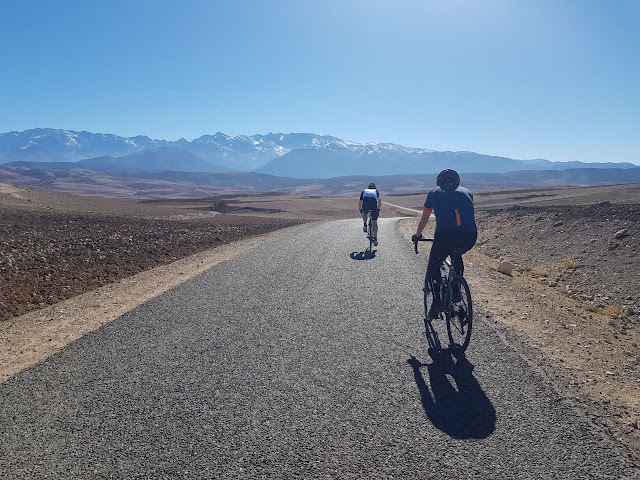 Morocco is not a rich country but the roads were generally good, definitely good enough for the carbon road bikes most people were using. The locals aren’t particularly cycle friendly but given the low traffic volumes, this wasn’t a problem. The weather and the scenery more than lived up to expectations. It was cold in the early mornings but once the sun had got up it became pleasantly warm rather than hot, perfect cycling weather. The scenery, particularly in the more remote Anti-Atlas, was fabulous with the clear winter light showing it to its best advantage. Compared to India, Sri Lanka or Myanmar there isn’t that much going on in the Moroccan countryside although the occasional camel traffic jam kept us on our toes. 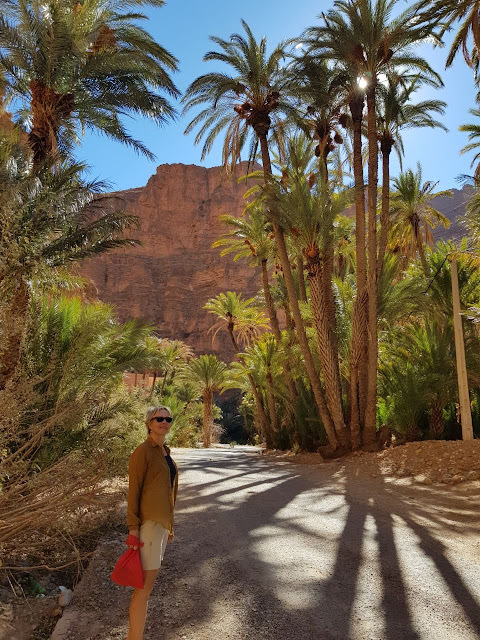 So despite the premature demise of my phone, the loss of the first version of this blog, I’ve really appreciated not having to travel to the other side of the world to get some mid-winter sunshine tonic. Relatively speaking Morocco is on our doorstep and cycling through the Atlas Mountains is a great way to enjoy it. 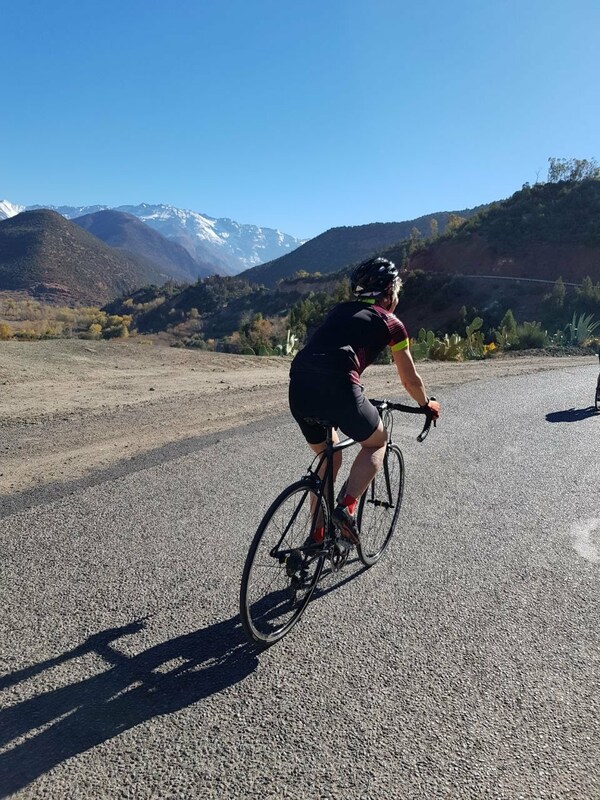 Happily, the transfer out of Marrakech also took us into the Atlas Mountains foothills, although there was still another 1000m or so of climbing to do in the late afternoon up to Imlil. The initial part, across gently undulating land with a snow-topped mountain backdrop, was breathtaking. After the first of what was to prove a series of wonderful lunches the hard work began. The group hill climbing pecking order was established and after a short-lived effort near the front I retreated to a more modest position. The hotel in Imlil had good heating, which we needed when the temperature dropped at sundown. A relatively easy day the highlight being two long descents both completed before mid-morning coffee. We started early and it was very cold but the ice we had been warned about never materialised. 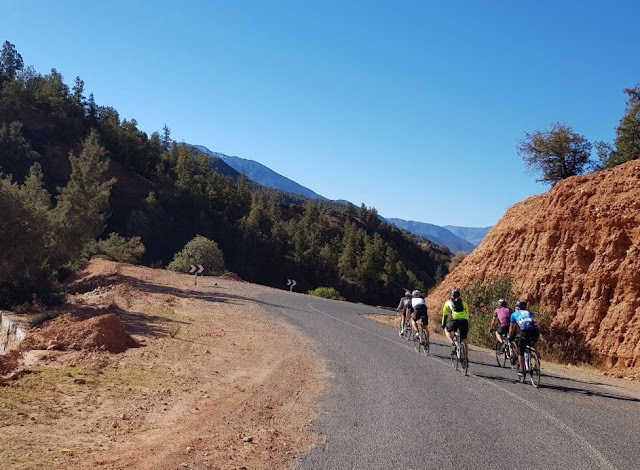 After descents involving speeds (which given my skills were probably dangerous), the rest of the 41-mile day involved an easy climb along the side of a river south into the heart of the Atlas Mountains. The gite in Ijoukak was primitive with little in the way of hot water. 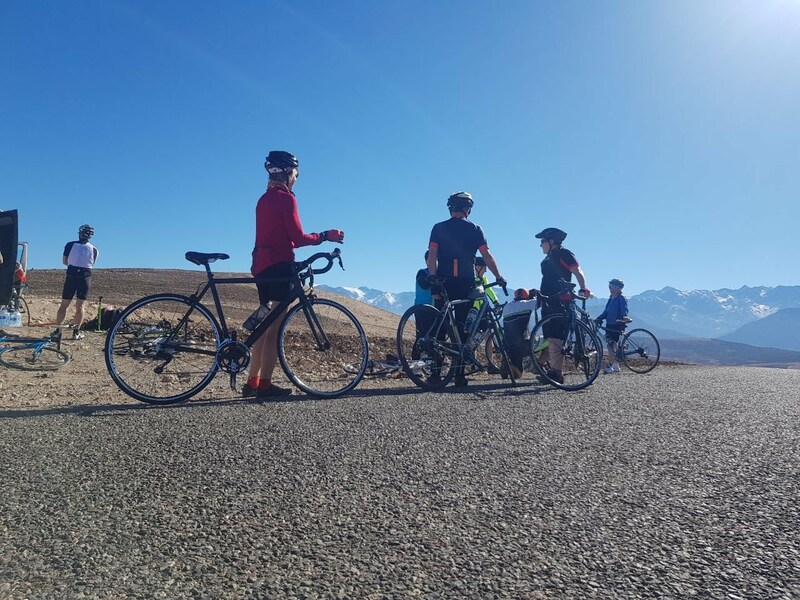 An epic day involving a huge 1200m climb up a pass, the highest stretch of paved road in Africa and a massive and thrilling descent. Lunch was near a cafe at the top which had amazing views across the Souss Valley to the Anti-Atlas Mountains and which served particularly good coffee. 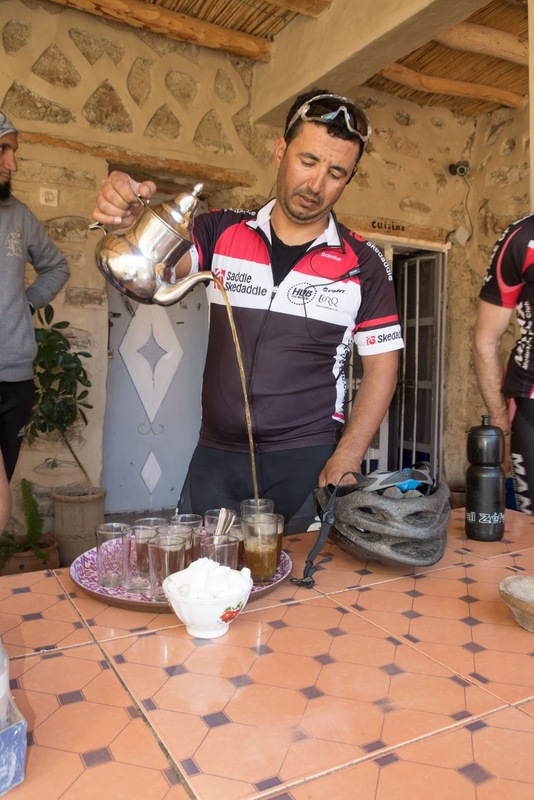 The coffee turned out to be the perfect restorative following what was a multi-hour climb. Everyone made the descent safely but one of the group had a nasty accident in the roadworks near the bottom. 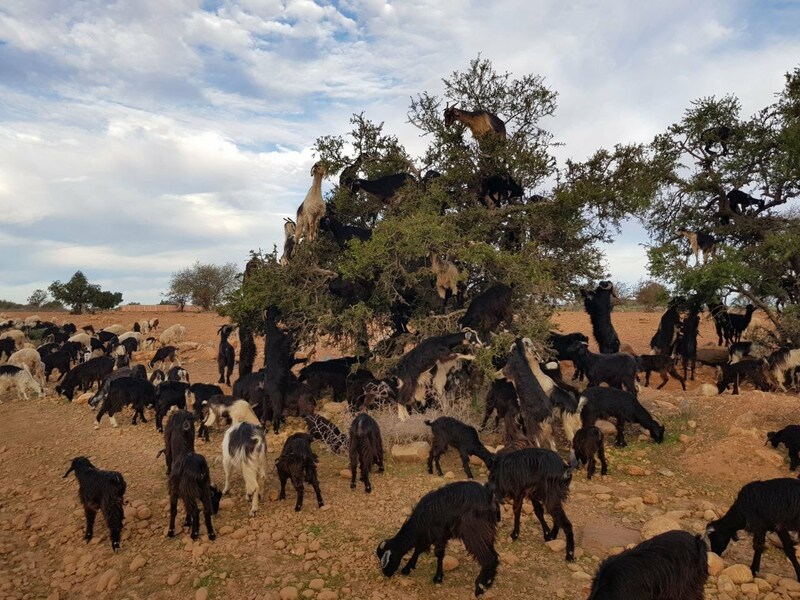 It was bad luck for all concerned and a dampener to an evening spent in a hotel set inside Taroudant's ancient fortifications. 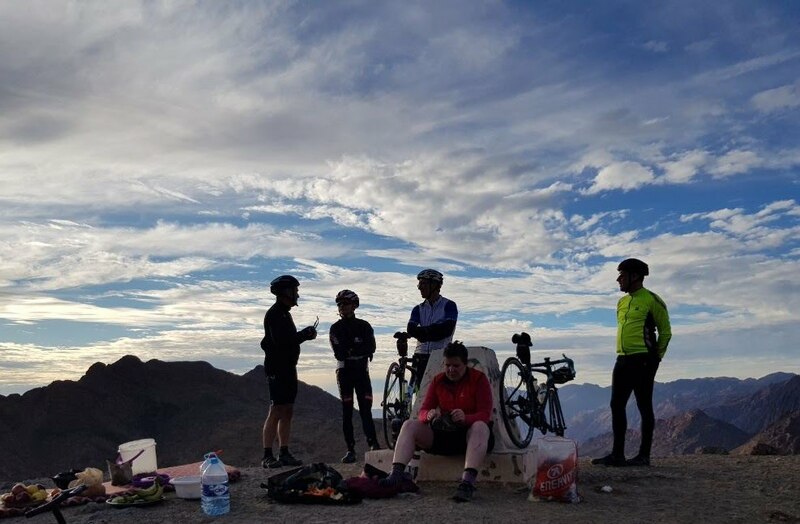 While the transfer at the start of the day took us well into the Anti-Atlas Mountains, day 4 involved 1750m of climb. The morning uphill stretch to lunch was lovely and relatively easy, but it meant there was a lot of work to do on a full stomach and in the heat. 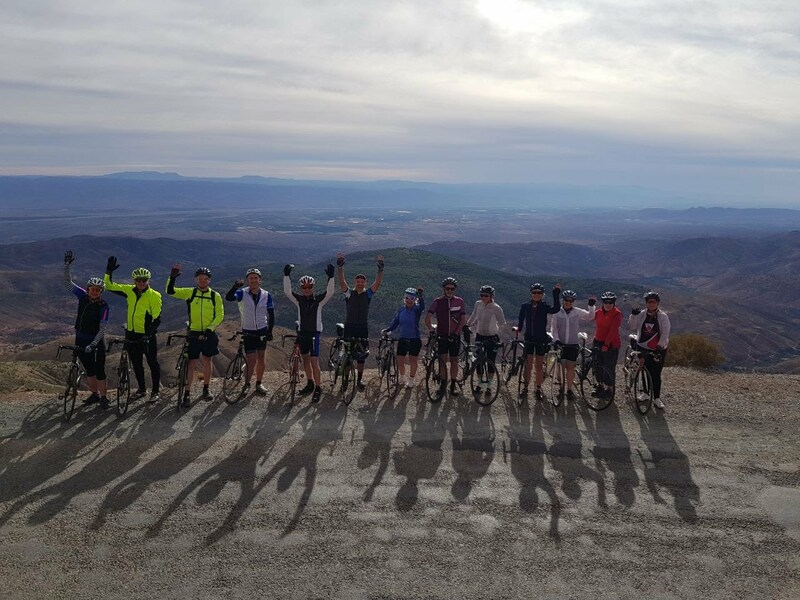 The hard work took the form of four short but steep little passes and the light was beginning to fade as the group reassembled on the top of the last pass prior to another massive descent. I'm a relative novice when it comes to road cycling but belting down a long hill in a group is a particularly thrilling experience. 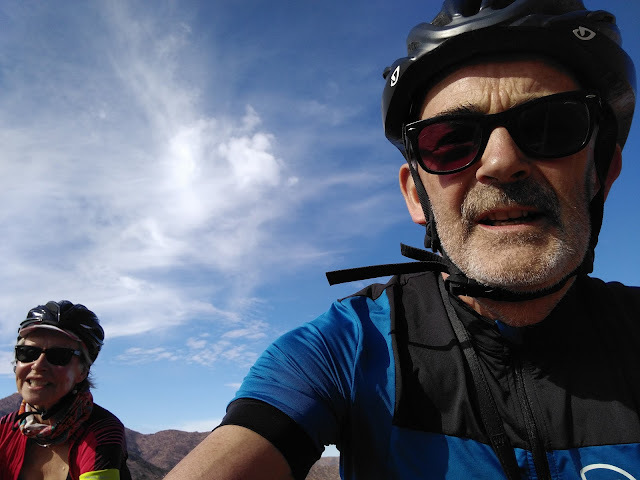 Bizarrely by Day 5 I seemed to have acquired a taste for cycling uphills so instead of going shopping with Christine in Tafraout, decided to join the masochistic faction, find the nearest mountain and cycle up it. Although I missed out on a pair of pointy slippers, making it to the top of another pass followed by yet another crashing descent was the better end of the bargain. We met up the rest of the group for lunch in an oasis on the other side (lots of towering date palms). After a walk up a lovely red stoned gorge, the mini-bus took us back up to pass where the late afternoon sun made the most of an already stunning landscape. 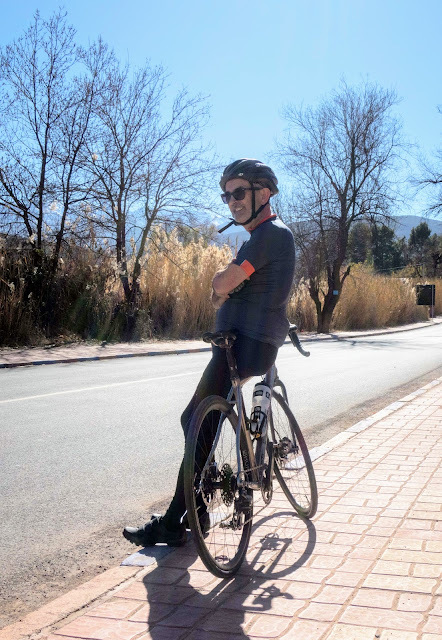 Day 6 included, somewhere, over 1000m of climb but the dominant memory is easy riding across a huge high level plain and another massive descent. The ride across the plain was particularly good. With some wind assistance and perhaps a gentle decline the cycling was easy and fast, I felt like I was in my thirties rather than sixties. After coffee it was downhill (almost) all the way starting with a 20km descent on a particularly good surface with some huge hairpins. The only problem was our little 3 man peleton was behind a taxi which kept holding us up on the bends. Accomodation in Agadir, after a transfer into the city, was pleasantly luxurious. Not sure whether the exertions of the last six days had finally caught up with me but I found Day 7 particularly hard. As with day 4, the really hard work came after lunch and somehow I hadn't anticipated it, which in my experience only makes it worse. The climb immediately after lunch was particularly steep and it was made worse by the fact that Christine was ahead and going like a train. No complaints about the cycling though particularly once the heat had died down in the afternoon. The hotel at Immouzer was especially nice and if I had been a little faster on the way up I would have had time for more than just one beer on its veranda before the sunset. After a relatively gentle undulating ride Day 8 was all about the long descent down to the motorway. I was particularly cautious, nervous about a last day crash, but still managed to enjoy the final massive descent of the trip. At the bottom we said goodbye to the rest of the group, a particularly nice bunch of people, and headed to Essouria for an extended Moroccan stay in a beachside hotel. It was a great trip and we will definitely be doing it again. 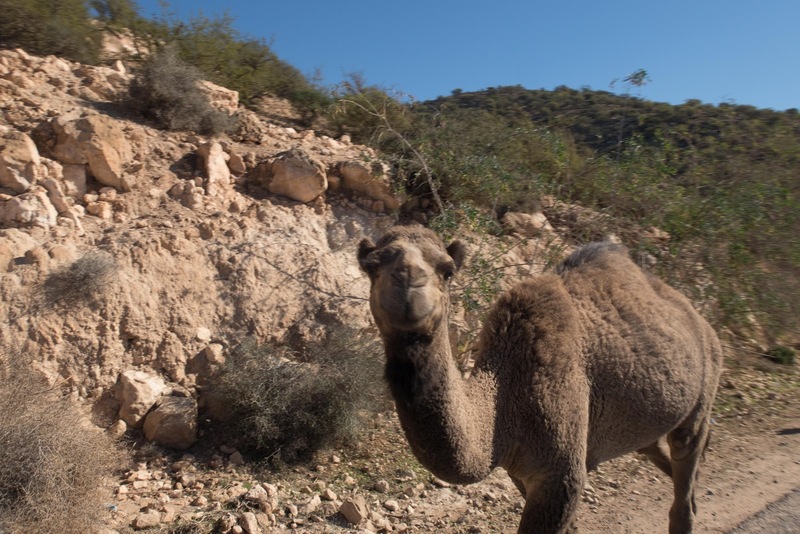 Most of the photographs in this blog were taken by Alistair and Saiid - many thanks.